Beyond the Walls of Stanley-Liam and Lyric Continue Their Journey! The program dogs from 2017 proudly displayed by the Warden’s office! Today seemed like a day that I was excited for and dreading all at the same time. I was excited to see Lyric and Liam finish one leg of their journey and have the opportunity to go into their long-term foster homes because that meant they were one step closer to the day they would graduate. But, I was also dreading this day because I know what it feels like on the day that you are turning in your puppy in training; and even though you know that this is all part of the process and so worthwhile for the final objective or raising assistance dogs, it’s a difficult day none-the-less. Today wouldn’t be hard for me other than the fact that I would be watching others saying goodbye to their dogs in training, and as a volunteer who has puppy raised, I could commiserate with their feelings all too well. I saw it as soon as we got into the correctional facility-the handlers were out playing with their dogs and having fun-but the look on their faces told me there was more than just playing going on. They were processing the day ahead of them, and they were quieter and less conversational which I could totally understand. Petting the dogs by the handlers was more frequent, the kibble rewards were flowing freely, and other inmates that aren’t part of the program could see and feel the change in the room as well I’m sure. Changes were already happening; the inmates had packed up the items for the dogs and some if not all of them that were switching cellmates had rearranged their items and moved in with their new roommates. Change happens quickly here, and I wondered if that was a piece of self-preservation learned over the years or simply a way to move on and start fresh again. Before we knew it, filming was coming to an end and it was time for the handlers to say goodbye to Lyric and Liam. I watched from a distance, mainly because I knew if I got any closer I wouldn’t be able to contain my emotions which were hanging by a string the way it was anyway. I didn’t want to make the day anything more difficult for the handlers than what they had to already do. The snuggles with their pups in training were heartwarming and sincere and it was clear what these dogs had done for their handlers. They had given them the gifts of patience, confidence, a learned discipline in dog training, trust and teamwork and that just was the tip of the iceberg. One inmate told me that this was the best thing he has ever done with his life and I was amazed to hear this verbal acknowledgment. It was during those moments I realized the gravity of one dog and a person who is incarcerated. The research shows that dog programs in facilities like these reduce recidivism and create success in the handlers-and I’m confident that these 4 men will prove those statistics right. Success in dog training is easily transferred over into many aspects of life because you need the same skills in life as you do training a dog. It’s more than just a dog. And turning them over for the next part of their journey is a difficult one. As a whelping home, we worry about the next step for the puppies that we have loved for their very first weeks; as a great-start home we worry about the next step in their journey for the pups we have loved from the time they were 10 weeks old; as an inmate handler/puppy raiser you worry that the foster home for the pup you have loved many months or more won’t be able to give the puppy the same amount of time and attention that you have provided every single day since they walked through your doors and into your heart; and as a final foster home we worry whether we will be able to give them all of the skills they will need to have in order to realize the vision of the organization to give freedom and independence to those that are waiting for it. It’s not easy! All of this involves stress and whether we can do the job we volunteered to do. There are moments of doubt and lack of confidence-did we do ENOUGH???? What does ENOUGH look like? And then I tried to figure out what I could do to share with the handlers a little bit of Lyric and Liam after they left so staff and handlers could see that everything was well. I figured the best way to do this is to share the comments from other fellow volunteers-and these are for all of the inmate handlers that work with dogs from Can Do Canines! And although this story is about the Life of Sugar and her L puppies, I don’t forget for one moment that Liam and Lyric weren’t the only dogs that left the program yesterday to start the next step and that next week more dogs will be leaving there. The feelings I talk about here apply to all of the handlers in the program and my appreciation and gratitude is for everyone who makes that program successful-from Can Do Canines, the Staff at Stanley and the inmate handlers. It couldn’t happen without all of them! Throughout this post is a glimpse of Lyric and Liam when they arrived as well as their final day with their handlers……. So, if there was any doubt that volunteers are rooting for the success of the Prison Programs or the success of the dogs that pass through them, you can see that volunteers all hope for a graduation at the end of the rainbow!!! After 8 months here, Lyric’s all grown up! My biggest disappointment of the day was that I didn’t get the opportunity to go back in and say goodbye to these volunteer handlers due to the filming schedule, to shake their hands, congratulate them on a great job and wish them well….and I just couldn’t write a blog today without taking an opportunity to do that. Thank you. You have been willing to open yourselves up to allow me to follow your journey with Lyric and Liam. You endured the endless questions, the changes, and interruptions in your daily life so filming could take place, and you still managed to keep training the dogs to the highest level to increase their success once they left you and your PAWS program. You have given them a piece of your heart, and that is the best thing these dogs will use to make you proud. You have learned to trust in them, and they, in turn, have learned to trust you. It may not have always been easy, but you didn’t give up on them or yourselves. That is what maybe impressed me the most because as a puppy raiser previously I had to struggle through the training challenges and had to figure out what I could do to stay positive, continue training and wait for the moment when the dog finally clicks and understands what you are asking them to do. Sometimes it would have been easier to give up – but with determination comes success!!! I am so appreciative that you allowed me into your lives to get just a glimpse of life at Stanley within the PAWS program. You may have been learning many new things, but I was learning along the way as well. The lessons I’ve learned are dramatic and for me, they are life changing. I know being a part of a film project is daunting and fun all at the same time. But filming wouldn’t have been successful if you hadn’t shared your experiences, challenges, and your heart. On Saturday, the first two dogs from the Stanley program(Harvey and Rio) graduated with their clients. I can only imagine how proud you feel that you had a piece in that story of their success!I can’t wait for the day where you can see Lyric and Liam graduate! I would love to see the grins on your faces when you see once again that through this program you are changing lives!!! And my grin will mirror yours-because I know the hard-fought journey for these two beautiful pups required a commitment that many might find difficult to comprehend. Congratulations to Ronald, DJ, Marc, and Vernon as well as all of the handlers working with dogs! Wishing you continued success in everything you do on your journey!!!! Liam showing off some of his tricks in the Can Do Canines Training room! The tail wag while sitting up was impressive! Waiting for his next command…..with his beautiful eyes focused on the treat! Lyric did a beautiful park while waiting for the filming to begin! Day 336-A Banquet to celebrate SUCCESS! Lyric enjoying some snuggles with his handler! Last night I got the wonderful experience to attend a banquet at Stanley Correctional Institution for the PAWS program with the inmate handlers and sitters. And while I make the long drive to the facility, I often think about what I can learn during my opportunity. What is it about the prison programs that makes them special? Why should anyone care about the dog programs in prison? Are these programs valuable for anything other than just having a place to put dogs until final training? Each time I get the privilege of getting to see a program like this in action, I gain a newfound respect for the programs as a whole, for the Correctional Institutions that invest time and energy to make a program of this magnitude a success and for all of the individuals themselves that grab this opportunity and turn it into something very special that an outsider like me will probably never be able to grasp in totality. I arrived and anxiously awaited the opportunity to get to the visiting room where the PAWS Appreciation Banquet was going to be held. (PAWS stands for Prisoners Assisting with Service Dogs) Once I entered, I saw a room full of handlers with their dogs and you could feel a true sense of community in the room. Other volunteers, staff, the Warden, program trainer….everyone was there visiting and truly enjoying the opportunity! The handlers were so kind and made sure I had time to visit with both Liam and Lyric and I had to tame my excitement about seeing all of these incredible dogs getting ready for the next step in their journey towards graduation as assistance dogs! I got the opportunity to talk with some of the handlers and I asked them how they were feeling about the upcoming “event” of sending their dogs to final training. 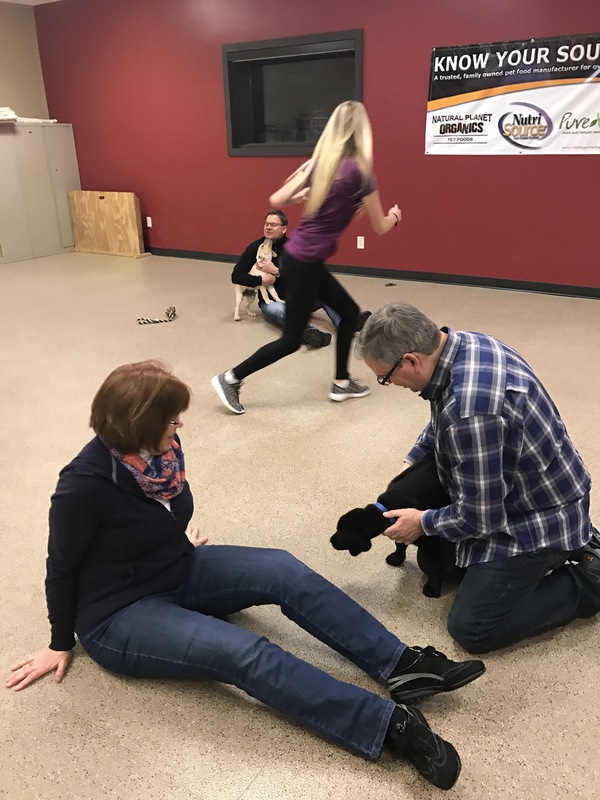 We talked about how the moments would be difficult, but they would be laced with excitement for the “final moment” of seeing their hard work being realized as the dog they trained walks across the stage with their client someday in the future. The pride they felt was palpable; the excitement in their eyes was readable; the emotion in their hearts about this partner of theirs was understandable! More than once I had to distract myself so I didn’t tear up just thinking about it! The fun of the evening was just beginning! We were able to have a wonderful dinner with the handlers, and just enjoy conversation about the everyday things! I was able to meet the other dogs in the program-the H’s, I’s, and J’s-Helga, Huey, Hickory, Ike, Iris, Jasper….and the list continues! I sat back and watched the handlers interacting and how completely comfortable they were with a dog at their sides. I absolutely loved seeing the fosters/volunteers from the program who take the dogs on weekends to add to their socialization skills and home life and it was fabulous to see the whole group just talking and connecting through the love of dogs! The differences disappear and the similarities blossom all because of these 4 legged wonders! 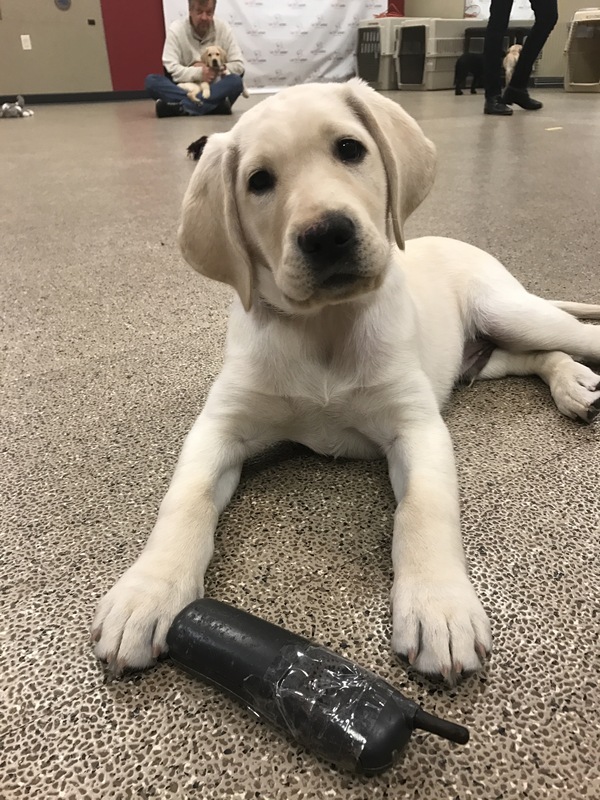 We were honored to be able to hear the story of a client and how a very special assistance dog has changed her life; and while I was listening to her story, I realized that this is maybe where the journey of an inmate handler and that of a Great Start home/Puppy Raiser differs the most. Outside of prison, the dogs we choose to work with are part of our everyday lives-and a very important one at that. We put amazing amounts of energy and time into training the dogs, but we have other endeavors and things that require large portions of our time. But for these handlers, oftentimes these dogs are the majority of their schedule from the moment they wake up until they go to bed. Certainly, they are also busy with daily activities and jobs, but these dogs become their constant companions and their confidant-someone they can share their hopes and fears with. In a way, these dogs start their “assistance” journey when they come to prison; they help these inmates find peace, teamwork, success, pride, trust, hope, and joy just to name a few. What a wonderful opportunity to visit with the handlers and learn about their journey with their dogs! The handmade items I’m holding are incredible! I know that there are sometimes struggles within prison programs in the area of teamwork; but when you think about the close proximity that these handlers have to live and the added stress of their situation I think they are doing wonderful! I watched the other handlers as one of their team was doing a demonstration and they couldn’t hide the fact that they were enjoying themselves and the success of their teammate! They took a moment to thank their trainer, and it was very obvious how much they appreciate her! They made her a beautiful token of their appreciation, which promptly made me cry! Towards the end of the evening, items were won through a drawing and all of the items were made by inmates. Their talent is amazing! Yep, best friends is an understatement! When the evening was over, I once again felt so lucky to be a part of this very special journey. I so enjoyed getting to talk with the handlers, seeing their accomplishments and witnessing their change along this incredible journey! They are not the same people they were when they started in this program, and THAT is why programs like this are priceless! Just a couple of the comments from Liam and Lyrics handlers-I think “Thank you for the chance to show how Lyric changed my life” says it all. There is absolutely NO doubt that these dogs change lives well before they are placed with their clients. Day 318-Training with an Inmate Handler-The Journey Continues! The unbelievably talented producer Mark with two of his stars for the documentary! Liam on the left and Lyric on the right. And yet another incredible day to visit the Sugarbabies Lyric and Liam, interview the incredible handlers, watch all of the Stanley dogs interacting and playing, and appreciate their great training talent and the prison programs that help to make Can Do Canines dogs successful and life changers! “Inspiring” doesn’t even do justice to the day and I so appreciate each and every opportunity I get to learn more! The training that the handlers are doing with all of the dogs (not just Lyric and Liam) is truly magical. As a volunteer myself, I watched them show me some of the training and commands and I couldn’t believe my eyes! Teaching the dogs that they have independent foot movement by placing their feet on small FITpaws objects one at a time on command, pinwheels spinning in one direction, Whirling by turning and spinning in the opposite direction with a flick of the wrist, “parking” by turning around in front of the handler and backing under a chair they are sitting on, taking the full bag of training treats gently to another bystander with a soft mouth and never even TRYING to eat the treats, pivoting beautifully, sending them out around a post from a distance where they return to a beautiful “front” position waiting for their next opportunity to please their handler……the list could go on and on!!!! Oh, and did I mention the ‘simple’ job of a dog performing tasks based upon a music note that is being sung??????? 🙂 To be honest, I felt a little bit inadequate as a volunteer trainer! I was thinking, “Wait, I have to learn how to teach that!” I had to remind myself that the obedience portion of the training like sit, down, wait, recall, and loose leash walking is the most critical part of assistance dog training, and that the reason these dogs know so much more is simply because they have much more time to learn these things and it gives dogs in prison jobs to do to keep from being bored. As I spent the day interviewing them and watching their efforts unfold in amazement, I kept thinking how much time they have spent working with these dogs. They are making a difference in these dog’s lives, and they are making a difference in the lives of the future clients. As volunteers for this organization, we tell ourselves this as well. But as the day progressed, I got a sense of HOW MUCH these dogs are changing the handlers lives-and it is in this place where the difference between inmate handler and volunteer diverges a bit. As volunteers outside of the prison program, we take a puppy or dog into our home and we independently train it to the best of our ability so that someday in the future it will have the best chance of being an incredible partner for a client. It is us and a dog. We go to training class with others, but it is mainly one on one work that we do with the dog. I want the dogs I train to make everyday life easier, social opportunities greater, and independence for the client is an expected result I hold myself to. In prison, the handlers have the same task-but with many more obstacles in their way along the journey. They live with others 24 hours a day and have to navigate through the intricate world of how others around them play a part in their journey. One-on-one training doesn’t happen nearly as much, and most of the time they are together with others. They have “sitters” for when they are unable to be around the dogs, and therefore there may be differences of opinion on how to train a dog. Some handlers may want to share their knowledge with others, while not everyone else may not be interested in hearing their expertise. Imagine what it would be like if you had to spend all day, every day, with 20 others who are training dogs-eat, sleep, train and play together. And then maybe you can imagine some of the daily struggles that might be encountered along the way. During this journey, they have to learn to interact with the assistance dog in training that they are caring for, but they have to grow in learning how to interact with other inmates and handlers along the way as well. All of sudden, if they learn to trust the process, life transforms a bit and they have to see outside of themselves and work towards a goal together. And as important as “graduation day” is for all of us volunteers to see our dogs in training cross that stage, it takes on a much greater importance for these handlers. It may very well be the proudest moment of their lives, and you can feel their excitement about seeing the dog they trained on stage! During the interviews, this is the part that impressed me most and more than once reduced me to tears. I listened to the handlers express their joys and their struggles, and they more than once talked emotionally about how it’s not easy, but it’s worth it because of their love for the dog in training. Some of them talked about how it used to be just about them and they never thought of anyone else before, and now they have to work to create a future for a dog so that they can change someone else’s life. And they admitted that it’s not always easy to make that leap from thinking only of themselves to putting someone else first, but it was obvious that were putting their best efforts into the process and that is truly inspiring. Maybe one of the many benefits of having a program like this is that the handlers get to let their guard down a bit-they get to share emotions, and they get to invest their heart. It is often said, even by me, that this organization couldn’t be successful without the participation of the prison systems that are currently part of the program. But what is sometimes left unsaid is that it’s very likely that some of these handlers couldn’t be as successful in their journey to change and develop if it weren’t for the love of a dog. These very special, born for a purpose pups! Thank you to everyone that has allowed me the opportunity to see into a part of the assistance dog world that not many get to see! It has changed my perspective, and it has given me a newfound appreciation for gifts that assistance dogs give to everyone along the way. They don’t just change and touch the lives of the clients they are placed with; they touch the lives and hearts of hundreds along the way-and those whom they touch will never be the same! Liam and I having a conversation about his ‘star quality”! I so loved having the opportunity to reconnect with the pups again! Liam taking some time to enjoy a pool break during the 90+ degree late September day! Day 69-The Names of Champions!!! Tonight was the night I had been waiting for since they left our house. The night when I would have a reunion with the little balls of fur I had fallen in love with. Tomorrow they turn 10 weeks old-And this was the night that they would be named. There was so much anticipation and excitement in my heart throughout the day that I thought I was going to be sick on my way there. I picked up Ken at work and quickly got us there 20 minutes early, and then the waiting game began…..
Mark was there filming the evening and the first thing on the agenda was learning about the names that had been chosen for the litter. They are the L litter so all of the names would start with an “L”. I got to bring the “list” that I had emailed to Can Do Canines with some suggestions of L names that either I liked or those making suggestions on the Life of Sugar facebook page. It was a LOOOOONNNNNNGGGG list, so I was fairly certain that SOME of the names on the list had to be chosen, or would they???? They would tell me the names that were selected, and I would have the fabulous opportunity of choosing which pup would get which name!!! You have no idea how exciting the thought of being able to match a name with the puppy I thought it would fit best was for me!!! It was then that I was sure the pups remembered us! Ken was enjoying the puppies just as much as I was! First was Lizzie/Miss Purple and Logic/Mr. Blue-the two pups going with another organization, so while these are their names for now, they will most likely be renamed when they go to their final destination. Then there was the name-a-puppy; someone had donated or raised funds in order to have the opportunity to name a puppy from a litter and Miss White would have the honor of carrying the name-a-puppy designation and the name Lola! We were down to the final four (always important in sports, so of course I thought it was just as important in this situation as well!) I was shown the final names that had been selected….Linus, Lyric, Leonard and Liam! My heart almost leapt out of my chest as I realized that Liam happened to also be the name of my grandson! I immediately broke up with tears of happiness that I would have the opportunity to assign one of the pups with a name that was so near and dear to me, and of course I knew EXACTLY which puppy would get that name……..the puppy that stole my heart early on in the first day or two and I had no idea why. Of course, that name would go to Mr. Orange! One of the great things about puppies being named is that many people are able to make a connection with a name in one way or another-the name of a family member, a friend, a beloved pet, or a colleague. When it happens and you can make a connection with a name, you immediately adore that puppy just a little bit more if that’s even possible! Then Kaity showed up with the Can Do Canines van and walked in to let us know the puppies had arrived! I got to reintroduce myself to them in the “potty yard” since they had just had a very long ride back and I loved when they ran up to me and jumped on me with their wet paws. It seemed like they had some inkling of who I was and as time went on that “memory” seemed to take hold. By the time we got into the play room they seemed completely okay with Ken and I being there and to me anyways it seemed like they had made the full connection. We would call them back and forth and they would come running across the room, and once again I would bust out in laughter at their big ears, their clumsy feet and their lanky bodies! Mr. Yellow/Linus trying to figure out the mirror and how to get to the people in the reflection! So, the evening progressed-playtime with all of the puppies, running around, calling them with a ridiculously high voice and letting them crawl all over me and maul me and then I would squeal with delight! It was like everything around me disappeared and my vision only included the puppies-I didn’t notice anyone or anything around me and once I got home I realized that it was like a blur, except for the crystal clear images I still have in my mind of each of the puppies. And then the time came where the new puppy raisers and great starts got to come in (in 2 different shifts) to meet with their new pup! At that moment, it brought me back 5 years ago when I was the one coming to pick up a puppy that I was waiting for and I remembered the absolute thrill of those first moments; it was incredible to be on the other side of that and to watch that pure excitement of others. I was so incredibly happy to be able to witness that! All of the volunteer puppy raisers are excited to get these puppies; they have to figure out what these puppies are like; how they are going to fit into their household and all of the other concerns that go along with having a puppy in your house-but the joy I saw when they walked in to greet their new member of their family is what will keep these families enjoying every moment they get to spend with these puppies! 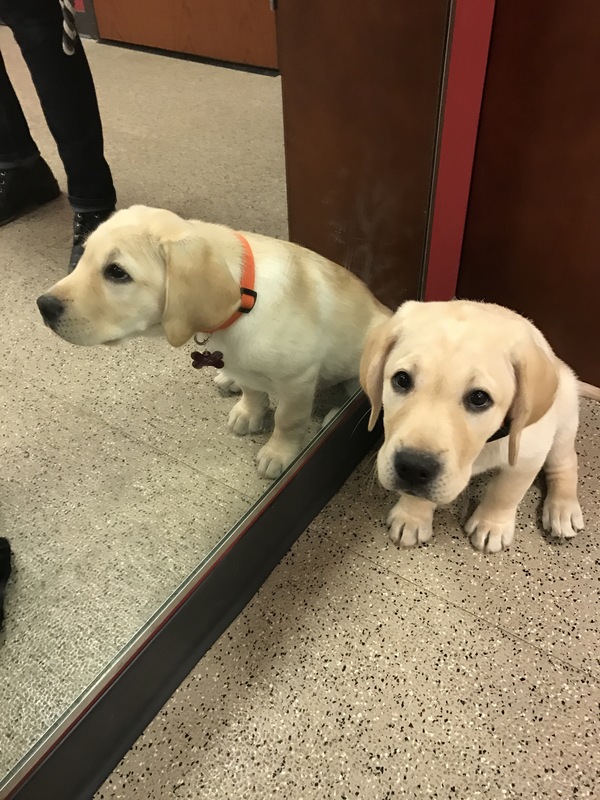 They didn’t take long to figure out that Dora was the key person to hang around…..
One by one the puppies started to leave the room with their new families, and at one very brief point I thought for sure I was going to cry at watching them leave. I have no idea why, because I was so happy to have the opportunity to meet the families and have the reunion with the puppies. Maybe it was because the evening was filled with so many different emotions that I was going to overflow with the excess, maybe it was because this was the final moment that I would be officially a part of these puppies lives, or maybe it was because I was a little nostalgic that tonight was the last night these puppies would be “littermates” that got to play and fight with each other. Luckily for me, I was able to make a quick walk over to the corner of the room to pull myself back together before the final group of volunteers came in. And after 3 hours of being at the facility waiting, playing, and saying goodbye, it was time to go home. What I have thought about since leaving was my amazement at exactly what it takes for an organization like Can Do Canines to smoothly operate and combine all of the facets of all of these dogs to make sure everything is successful. I am so unbelievably impressed with all of the staff that insure the safety and placement of puppy raisers, great starts, fosters, final training homes, dealing with other organizations, the breeding program, the training program and all of the behind-the-scenes day to day operations of marketing, accounting, photography, business development, etc. that make this program so successful. I’ve been a great start home, a foster for many, a puppy raiser and a breeding/whelping home-I know the amount of work that EACH one of those programs needs just from my volunteer perspective and tonight I really felt like I got to experience a little of all of these experiences. I will add this to my “OIL” list; my Once In A Lifetime experiences. Thank you to all of the staff that make our journey as volunteers a meaningful one! I’m hoping to see lots of pictures in the future of these adorable L pups and I will share whatever possible along their journey through this blog and the Life of Sugar Facebook page. I can’t wait to see their future unfold!!!! Tonight I got to personally experience what can be accomplished when many work together for a common goal, and for that, I will always be thankful!!!! Mark, who has been filming all of the stages of Sugar’s journey as a breeder dog for Can Do Canines during the L litter and will continue filming the process of “puppy to assistance dog”, will be also adding some updates along the way of the puppies and what they are doing as they grow! His assignments have taken him all over the world, and I consider it extremely fortunate that he has chosen to document the process of an assistance dog and that Sugar is part of the story!!! He will be taking a variety of footage of the entire process which he did with Sugar during her pregnancy and after the puppies were born, and he sees it with the fresh eyes of someone who hasn’t witnessed this part of the assistance dog program! He will continue to film them along their journey and I can’t wait to see how they will change lives! I think it’s fair to say that during his filming he also fell in love with these puppies! I’m thrilled, as this will add another fresh view of the process and gives followers the opportunity for first-hand reports of their progress! Here is his update from yesterday: Enjoy!!! 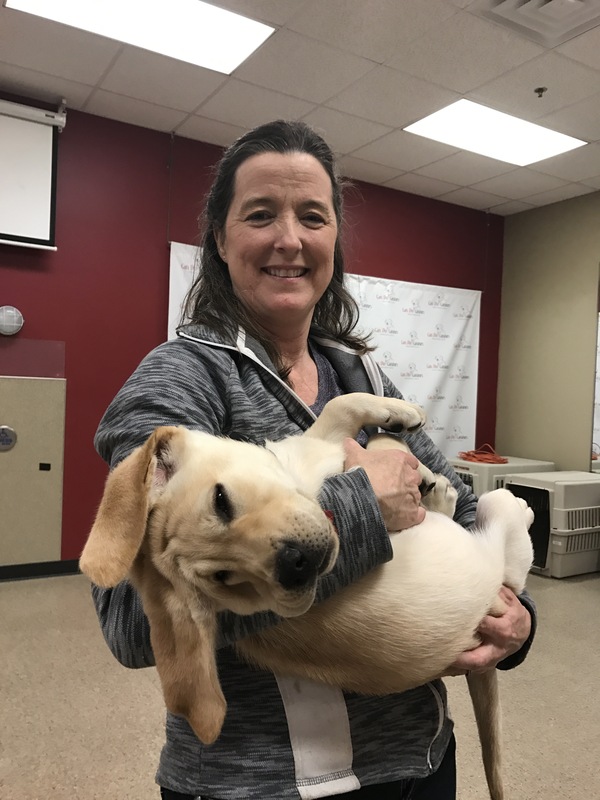 We’ve known for some time that two puppies from Sugar’s L litter will be raised by the inmates at Stanley Correctional Institution in Stanley, Wisconsin. As part of the filming project, I visited Stanley yesterday and met with the warden, Reed Richardson, his assistant, Lori Patrouille and Can Do Canine’s trainer, Dyan Larson. I first have to say that in my many years as a cameraman for Dateline/NBC, I’ve filmed in a lot of correctional institutions. However, I’ve never been treated better anywhere than at Stanley. They have granted incredible access to tell the story of Sugar’s pups in prison and I know it’s going to be amazing! This is all thanks to Warden Richardson who was the driving force in getting Stanley to become a “dog prison”, one of only two in Wisconsin! On my tour, I got to watch one of the weekly training sessions that Dyan leads. All 40 inmates of the Dog Unit are there, even if they don’t currently have a puppy of their own to train. As with all puppies trained at Stanley, the two yet to be chosen “L” pups will each be assigned to two inmates. I met both teams and they’re so excited to meet the “L”s and start the next phase of their journey. We don’t know the exact date when that will happen, but we’ll keep you posted. The two inmates share a very small cell and the crate takes up easily 40% of the floor. However, as you can imagine, there are NO complaints! The pups in training will go to the inmate work areas, just like other puppy raisers take their dogs to work. At night, the cell doors are locked but if a puppy has to go to the bathroom, the inmate rings a buzzer and his door is unlocked remotely. The inmate and puppy then go to a secured area just outside the housing unit where the puppy does their business. I’ve always wondered how that works and now I know! One of the sweetest things is the big bulletin board they have in the open area of the housing unit. Along with all the newsletters from Can Do and photos of the dogs they’re training, there was a big display of pictures that Holly took of Sugar and the pups when they were just days old. So, their excitement builds as the day gets closer to when they get to be introduced to their new additions at Stanley! Each of the pups worked to create their defense. And they ripped, chewed and tore at it with a new sense of joy. which brings back my big grin. the very best is the goal. to make them all they could be. how one day they would shine. because they make you believe. the best comes back to you. Good Luck to the beautiful, precocious, fun, sweet and loving L litter! I can’t wait to see the lives you change, the love you give, and the difference you make!!!! I’m going to miss you!!! Days 45 & 46-What’s in a Name? I often get asked how the puppies are named-although I don’t have all the answers because I don’t know the full scope of the program, I do know a couple of things that might answer some questions! Puppies currently are being named by letters of the alphabet, which I am assuming is to keep track of the litters better and to understand the relationships of each puppy. Last year, there were some “themed” litters like the Grandparents litter, the Spice Girls (Sugar’s FIRST litter), the Disney litter etc. but I think overall the alphabet system is preferable for most organizations. Sugar’s litter is the “L” litter which means that most if not all of her litter will have names beginning with L. Why “most”? Occasionally there is a “name a puppy” where someone has raised a certain amount of money in order to have the opportunity to name a puppy so it’s a possibility that in a litter there is a puppy that doesn’t have the same beginning letter:) There are a variety of ways the puppies can be named and each organization picks what works best for them and their breeding program. A friend came over to help socialize the pups on New Year’s Eve. Red wasn’t relaxed at all……. As a whelping home, we don’t name the puppies as there is a lot more to it than us just “picking a name” so the organization chooses the names. I also think this policy is in place partially to help organizations keepa little bit of the “separation of attachment” in place. It may seem like a simple task, but what I’ve learned over the last 5 years volunteering is that nothing is as simple as it seems! As whelping homes, we do get the opportunity if we choose to send in a list of our favorites and if the stars align and it works, it’s possible we might see a name or two from our list make it to the top and a puppy may show up with that name! Not guaranteed, but it’s fun for us whelping homes to send in some of our choices and anticipate the day when the puppies get named~! And why does it take so long to get named? Why am I still calling them by collar colors? Well, the process is pretty intense-in this case, there is another organization involved that will be taking a couple of the puppies for their program and there are many other moving parts that need to be considered before the names are given-so hopefully all of the pieces will fall into place in the near future and when they come back after 2 weeks at the prison I will hopefully get the opportunity to meet my litter and greet them by name! I feel like I am waiting for the birth of a child that I sort of know but need to see them with their name to make sure it fits!!! It may seem like a simple thing, but it’s not easy for me to wait that long to discover who these puppies will be! I have to have a conversation with myself frequently and recite “patience is a virtue” and “all in good time”……… but it WILL happen!!!! So what are some of the names I’ve thrown around? Here are a few! Maybe you have a favorite “L” name? If so I’d love to hear it! Day 44- Two by Two! Today the puppies earned the opportunity to come out of their play area and explore the house free from fences! I brought two out at a time to check out the bigger world with Sugar’s watchful eye and give them a chance to play with Sugar and test out a new environment. They loved the freedom and I loved watching their pure joy in playing! I made sure they had gone to the bathroom before I took them out but since they are small, so is their ability to hold their bladder so they only got to be out for 10 minutes at a time. I feel a little bad that they don’t get more of an area to play, so today was about redesigning space to give them room to run! The stakes were high with a full canine audience-who would win the match????? ?